In the mean time in 1941, Goodyear had built a blimp to replace the original Ranger, which it had sold to the Navy. The new blimp was also called "Ranger" though it had a larger envelope. By this time, Pearl Harbour had been attacked, and the US Navy wanted more blimps for wartime service as submarine patrol craft, so in early 1942, Goodyear sold to the Navy, the available commercial blimps: Resolute, Enterprise, Reliance, Rainbow, and (the "new") Ranger to the Navy. These five L-class blimps became the L-4 to L-8, with the "new" Ranger becoming the L-8. In summary, the first "Ranger" Goodyear blimp became the "L-2" and was lost in an accident. 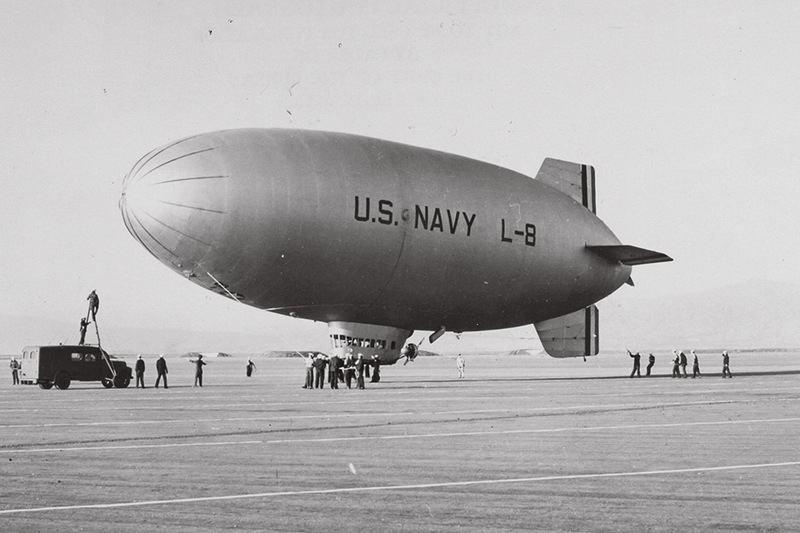 The second "Ranger" built by Goodyear to replace the original Ranger was then purchased by the Navy along with 4 other L-class commercial Goodyear blimps. This second "Ranger" became the L-8. The L-8 was stationed at Moffett Field part of Blimp Squadron 32 (ZP-32) operating out of Naval Station Treasure Island in San Fransisco Bay. The L-8 Would launch early in the morning with a crew of two, carrying two depth charges, some small arms and a machine gun. The blimp would be take out to sea to scout for submarines where they would navigate toward any unknown objects to investigate. Patrol flights could last nearly 12 hours. On 16 August, 1942, a routine patrol flight began at 6 AM. The flight had scheduled a crew of three, but the blimp was "heavy" that morning due to heavy dew from the morning fog and one of the crew was dismissed to save weight. Adrift, with no crew, the L-8 ascended to its pressure ceiling at which time automatic valves in the envelope opened to vent helium so the envelope would not burst. Blown toward land, and descending, the blimp was observed by countless thousands on beaches and roads. Already folding due to the reduced helium, no engines running, and no one on board to operate the air bladder to maintain the blimp's shape, the L-8 impacted the cliffs of Ocean Beach, south of San Francisco. The impact dislodged one of the two depth charges. Now free of the weight of the depth charge, the L-8 ascended again. 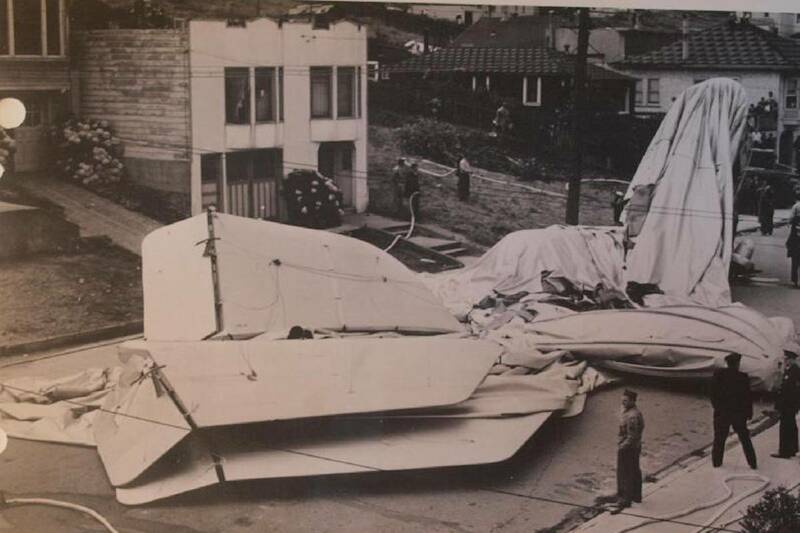 Unable to maintain altitude and at the mercy of the wind, the L-8 ultimately crashed on a city street in Daly City, about 5 miles SSW of central San Fransisco. The Navy, of course, secured the area of the crash an investigated. The remnants of the L-8 were gathered and sent to Goodyear where the control car and engines remained in storage until 1969. In that year, Goodyear refurbished the gondola, gave it new engines and attached it to a new envelope and named this new blimp "America", now a type "GZ-20" blimp. The America served as an advertising blimp till it was retired in 1982. 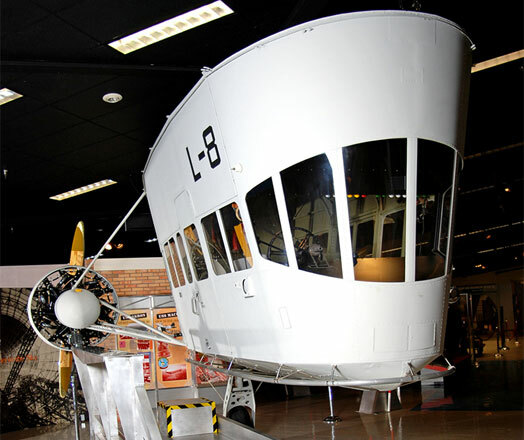 Finally, with the America out of service, Goodyear restored the gondola to its "L-8" configuration, and since 2003 the gondola has been on display at the Naval Aviation Museum in Pensacola, FL. The site of the crash, of course is notorious. 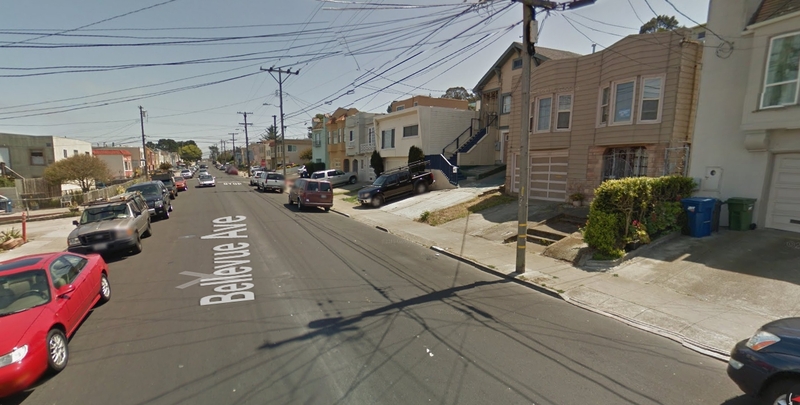 The location is in the 400 block of Bellevue Avenue in Daly City. 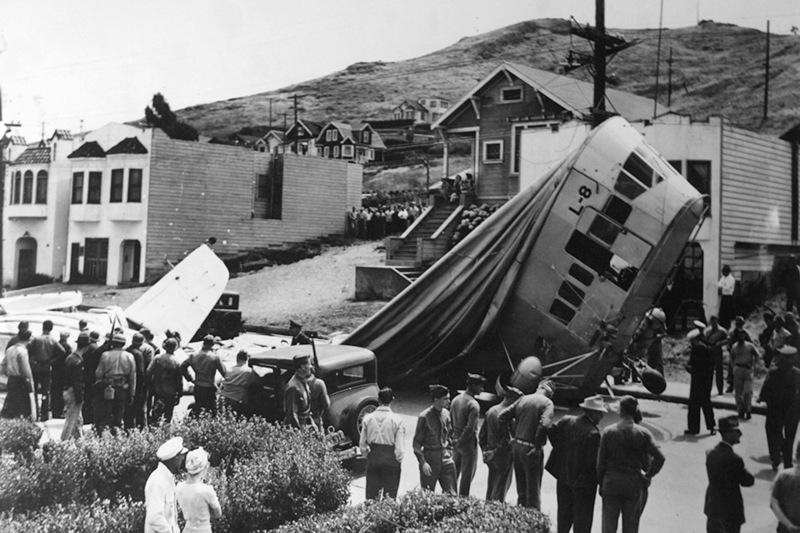 Note: There is another excellent website with some fine comparison photos of the L-8 crash in 1942, with the street scenes today. The site is check-six.com.